Seats 48 people, Stands 65 people. A frame tent is assembled with aluminium tubing joint together with connecting fittings that support the tent top. 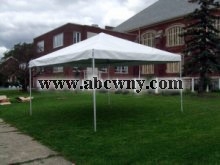 The rigid framework allows the tent to be free standing. No center pole required. Stakes required.